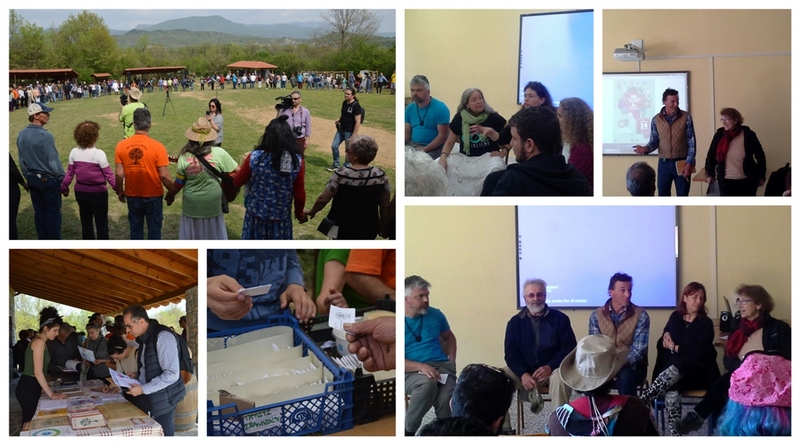 From 12-14 of April 2018, Navdanya, together with multiple civil society organizations, farmers, seed keepers and around 6,000 visitors, joined the 2nd Olympic Seed Freedom Festival, organized with Peliti in the area of Paranesti (Drama), in Northern Greece. Since 2011, Navdanya has taken part in the annual Seed Freedom Festival, to join forces to collectively defend Seed Freedom, Food Freedom and to shape a different future of food, that will protect biodiversity, health and soils from corporate takeover and industrial, pesticides and GMO-based agriculture. The idea of the Olympic Seed Festival was born on the occasion of the Seed Freedom Workshop held at the People’s Assembly in The Hague (October 2016), which was organized after the global mobilization of the movements, started in 2014 with the successful International Caravan for Seed Freedom and continued in Greece with the First Global Meeting for the Commons. This year the Festival saw two days of Conferences, in which more than twenty movements, civil society organizations, farmers and seed keepers, both local and international, intervened to discuss about food and traditional seeds sovereignty, how to contrast the multinational corporations take over on our seeds and lands, how to promote a food system based on agroecology and circular economy, which preserves the environment, diversity, and health. Among the participants at the conferences and festival: Rocky Mountain Seed Alliance-USA, John Caccia, Hands on Organics Intl-USA, Alan Adesse, Caura National Park and environmental activist-Venezuela, Leonor Fuguet, Organic Growers of Northern Greece, Hrysoula Skordite, Faucheurs Volontaires d’OGM – France, Matthieu Le Breton, Navdanya, Isabella Troisi, Holy Saint John’s Monastery-Greece, Abbess Theodekti, Agricultural Research Institute in Cyprus-Greece, Dr. Dionysia A. Fasoula, Kokopelli-France, Andanda Guillet, Arche Noah-Austria, Katherine Dolan. The final day of the Festival saw around 6,000 visitors and hundreds of seed keepers from all over Greece as well as from Bulgaria, France, USA, Italy and Venezuela among others. During the day, Seed exchange, workshops on Seed Freedom, seed keeping and Agroecology, took place along with a photo exhibition where Navdanya presented its work on biodiversity conservation, agroecology, and a photo reportage on “Fibers of Freedom” and “Gardens of Hope” describing the work with cotton farmers in India, building an alternative to Bt cotton. Through Navdanya’s stand, several publications were presented (among which The Toxic Story of Round-Up; Seeds of Hope, Seeds of Resilience, Terra Viva, Law of the Seed), together with the ongoing campaigns and activities. The festival was also the occasion to announce and invite the participant organizations and groups to the International Biodiversity Congress which will take place in India on the 6-8 October 2018. This year, the festival proved, once again, to be a unique opportunity to build solid connections and networks within the groups, organizations and movements working on the common ground of promoting Seed Freedom and farmers rights to produce, keep, sow and exchange their seeds. As in the previous years, the festival represented a great chance to strengthen the movement to collectively shape a different Food system, which provides more and better food, which preserves the environment and its biodiversity and guarantees Freedom and Democracy. The International Solidarity Caravan for Seeds in 2014. No Comments to "2nd Olympic Seed Freedom Festival in Greece"